7 years ago I threw myself a 40th birthday. I’m not much for birthdays, however, 10-year increments seem worthy. They are milestones and we grow and change so much in our twenties, thirties, and forties that we need to celebrate this. I had a good life at 40. I lived in a charming and very pink victorian and I had a good job. Not so good on pay but I gained so much from this job in the way of education, health, and friends I still have to this day although the school has dwindled, switched hands and most of us have moved on or to other states and counties. I enjoyed my life in that small coastal town and was not lonely. But I didn’t know what my future held and I did want to be a married woman at some point. Would I grow to be a busy spinster with my dog and cats? Spending my weekends tending to my flower pots and watching Downton Abby with other spinsters? Would I eventually slip into a funk due to unfulfilled wishes and dreams? Would I just go from job to job just getting by? Always living with roommates? I didn’t feel very hopeful of an amazing future. Our town consisted of 7,000 people and I had dated the most eligible bachelors and I can tell you that they were far from eligible for the long haul. My choices were bleak. I whined about it on the phone that night after my 40th birthday celebration. My girlfriend assured me I still had reason to hope and that she had this feeling I would have two children. Girlfriends love to roll out the crystal ball during therapy sessions. In September I celebrated my 47th birthday because grannie insisted we have a birthday party. I resisted and then I remembered the Universal Law of not resisting gifts because it halts the flow of abundance. And grannie was bored. She lite up with the idea of planning a party…so I gave in with some grumbling. It was a very fun party with neighbors, friends and some family, so much delicious food, and gifts! I had a great time. So did my husband. Bali got drunk and I had to carry him down the hall fireman style and throw him on the couch for the night. I didn’t mind, he gets drunk twice a year. I didn’t mind because this time when I celebrated my birthday I have a husband to throw on the couch. And I have two boys to snuggle with after all the fun and cake. So, here I am 7 short years later and I am sitting here typing away on a blog that is well received. I put together another book and sent it to my friend and editor right before my birthday. I am a full-fledged writer with a career. Not famous or rich, but doing well and blossoming each day. I have come very far in the last two years since I began this journey. However, my first and most important job is a mother of two healthy, vibrant, fun, kind, and wise boys that I’m pretty sure we have traveled many lives together. I have a husband that is such a good, devoted family man and works hard to make it possible for me to stay home and enjoy the children and build my career. When I fill out forms and write “housewife” in the space reserved for occupation, I feel grateful and proud. I wasn’t raised to feel proud of being a homemaker but my mother never enjoyed being out there working and having a cut-throat career as an attorney. She would never have admitted this but she would have loved to stay home and write and garden all day. Who wouldn’t? I hear some housewives complain and I don’t get it. I get that some women just want and need to be out there and work in the mainstream…but I’m not that lady. Been there, done that. I love nothing more than being home and surrounded by my children and pets, to smell homemade food simmering and baking in the kitchen, to listen to music and have my morning coffee leisurely as I do all the things I love. I love nothing more than cleaning my adorable cottage and giving thanks to God for his provisions and daily gifts. My job does go on all day and sometimes I pull double shifts if there is an illness, however, I don’t have to wake unnaturally to an alarm clock, commute to work in a dirty train or bumper to bumper traffic, deal with quota’s and bosses and the stress of not making the cut long-term or meeting expectations of the company. I don’t have to drop my children off at daycares and schools enclosed with cyclone fencing and wonder if they are alright, if they are being loved and listened to and if the caretaker is compassionate to their fears or soothes them when they cry. Wondering if they are being treated with respect or being bullied. My heart couldn’t take it. It’s a rough world out there and since I had children I don’t have the heart for it quite honestly. So, I have created our world. It is safe, warm, filled with love and fun. I have a sign in the kitchen that states This house is run on love, laughter and strong cups of coffee. If I wasn’t able to be a housewife I wouldn’t have all these moments with my children and full ownership of raising and educating them. I wouldn’t have this writing career. Being a housewife has opened up new worlds for me. If I wasn’t a housewife my children wouldn’t have this golden life of parks and forest, libraries, and being with their mother all day. They wouldn’t have an education that they love and enjoy or all the journey’s we take during the week. My family wouldn’t have a clean and tidy home filled with charm. They wouldn’t be enjoying all the homemade meals and breads. They wouldn’t be enjoying all the peace and slower pace that many Americans don’t know exist with their hectic schedules filled with schools, office, and commute. Most people have two days at the most to be home and those days are filled with cleaning, laundry, homework, errands, and whatever else that must be done before Monday. It’s a hard life for those parents that have to work and my heart goes out to them. I write the books I write about homemaking and frugal living to help anyone who wants this life. Not just to be a housewife but to have a better life on a fixed income or a life with less work out there in the mainstream and more work on your dreams. I write about a simple life with no debt and small bills for the office worker that wants to work on that novel and work toward being a full-time writer or the mom that wants to stay home with her new baby and not go back to that stressful management job or the father that wants to work part-time so he can go to school at night and improve his families life. We have to set our priorities right. For me family is at the top. Well, God is the foundation, family, and then work. Why have a family if you are so busy and working so hard that you have no time with them? Why are people having kids and then they go to work and put them in daycares and preschools? If you say, “I can’t handle being home with kids all day.” I ask you, why did you have these children then? Why don’t people prepare and make a life that centers around the family and babies if that is truly what their heart desires? That means living on one income. You might say, “that isn’t possible in this age.” I will say, yes it is but it needs to be planned and you have to make lots of big choices. You must choose the family over a big house, a minivan, lots of dinners out and vacations. You will have to choose the family over shopping and buying too much at the grocery store. You will have to give up fancy lattes and ordering online all the time. You may even have to grocery shop differently and learn to love rice and beans. You may have to take to walking everywhere and not having cable. Who cares, you have a happy family. I understand that some of us start families in debt from school and life. You can still make the changes to clear up the debt, live simpler lives, downsize, and choose family. It is a sacrifice for some time depending on how much in debt you may be but it gets easier, better, and you learn that the simple things are invaluable. Chasing the career and money gets old and that dollar and title won’t be there for you in your old age…and neither will your children if you have invested in work and not them. I understand that life just cleaning a house, cooking, and tending to children can get old real fast. This housewife gig doesn’t have to be boring or mundane. It can be fun and be creative. It also opens up opportunities. You can go to school online and from home, you can self-educate on any topic, start a backyard farm, become a writer, have a daycare or do some babysitting, learn to craft, build things, woodwork, garden, knit…it’s endless what you can do at home. Then there are all the fun things you can do on your down time like paint, read, sing, listen to music, have your afternoon tea and crumpets, get into a wholesome TV series (I’m hooked on Downton Abby). I write because it’s my outlet and it makes that extra cash. I write because I’m decent at it and I can do it from home at any time that works for my kids and husband. I can write and cook, write while waiting for the dough to rise, write will the washer is cleaning my clothes, write while my boys are playing. It doesn’t take away from the family. It adds to the home with the royalties and using them for home improvements like a new washer. Yay. And it makes me very happy because it’s fun! I hope to see more women or men choose to stay home in the future. It is a great job and can be very fun and life-enriching for everyone involved…even the dog. 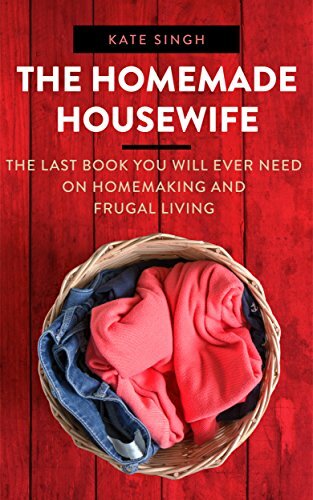 I have written several books on the topic of homemaking and the frugal lifestyle. My focus is on how to make it as easy and fun as possible. I keep my books cheap so everyone can enjoy them. Next My day as a housewife on the suburban farm. Gracias! We have to start on a second language…I’m starting now. There was something very tender and loving about this post, Kate. The choice you have made comes out of love, and that’s hard to beat. I raised my children very poor, very little money, but that was, as many people do not understand, an incredible benefit, because they had to search inside themselves to create their world. 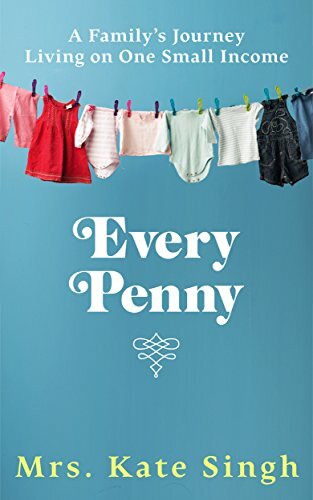 What I mean by that is, when children are given things, and things and things and every moment is activity planned for them, they are denied the opportunity to pull from what’s inside of them, their wonderful, rich imaginations. Your path is one of authentic creativity, steeped in love of God, family, and friends. How much better does it get? Sometimes being poor is a blessing. I see many rich kids that are absolutely miserable and lonely. Loved this post. It is nice to see others that love just being homebodies and spending as much time as they can with their kids while they are still small, they grow so fast, mine are are adults ( late teens) and I feel very blessed I was able to spend the time I have had so far with them. Beans and rice, second hand clothes and a lot of homemade Christmas gifts are memories I will always cherish with my family. I always tell my family that spending time together is better than ” stuff ” because memories can not be stolen and you keep them forever…worth more then gold to me. Absolutely! Now if we can encourage others and get them off this speed way to stuff. I was wondering if you could maybe write a post about when you became pregnant and if it happened quickly or if it was a smooth or difficult process. I love hearing women’s stories on their first pregnancy!